Holiday Inn L.I. City-Manhattan View sets the bar high for Manhattan area hotels. With views of the sensational and breathtaking New York City skyline just across the East River, our hotel provides an exceptional backdrop for both business and pleasure. At our affordable Queens hotel, just minutes from Manhattan, NYCs legendary landmarks have never seemed so accessible! Explore iconic attractions such as the Empire State Building, Rockefeller Ctr, Central Park, Museum of the Moving Image, Statue of Liberty, Times Square, Broadway, Macy's Herald Square and Madison Square Garden. Holiday Inn L.I. City-Manhattan View is a neighbor to many Fortune 500 companies, offering easy access to Citibank, MetLife, the United Nations, JetBlue and Mount Sinai Medical Ctr. Our hotel is conveniently located within a short drive of the major New York airports: LaGuardia, JFK and Newark. The Holiday Inn L.I. City-Manhattan View offers free high-speed Internet access and free computer services in the business center. Ideal for international travelers and vacationers, this Astoria, Queens hotel is located just one block from the N and W subway lines and just a few blocks from the number 7 line and the E and R subway lines. 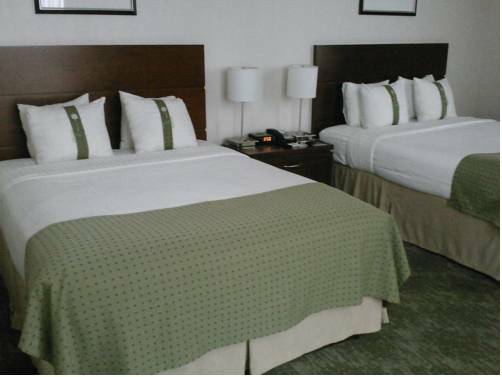 Start planning today and enjoy the great room rates and deals at Holiday Inn L.I. City-Manhattan View. Limited parking is available for $30 per night plus tax. Parking is available on a first come basis. Dutch Killls Centraal: Mellow gastropub doling out local American fare and craft beers in cozy digs with both a communal table and private seating. Crescent Room-: Located downstairs on our 'C' Level, the meeting room can accommodate up to 40 people classroom style and 70 theatre style. Just off the restaurant, the meeting room can easily provide eating facilities for any group. Banquets and catering available. Steinway StreetJust a short walk to Steinway Street and you can enjoy many local and Chain stores. Many shops and restaurants within a 12 block walk. ManhattanJust a few train stops from the hotel and you are in the heart of NYC and Manhattan where shopping abounds. Times Square, Union Square, Fifth Avenue, Canal Street and many more great areas in which choose from. Carnegie HallWorld-renowned theatre with shows daily. Central ParkNYC's largest park with many attractions and events. Empire State BuildingTallest building in NYC. Go to the observation deck for spectacular views of NYC and beyond. Grand Central StationLarge train station in NYC with restaurants and shops. Ground ZeroSite of the World Trade Center buildings. Metropolitan Museum of ArtWorld-renowned museum with special events and displays daily. Penn StationTrain Station in mid-town Manhattan with transportation to all of NYC and the surrounding states. Radio City Music HallWorld renowned theatre with special events and shows daily. Site of the world famous Rockette's Christmas Show. Rockefeller CenterSite of the world famous Christmas setting with tree and ice skating arena. Observation deck is open to see entire NYC and surrounding area. Citi Field (NY Mets Baseball)Site of NY Mets baseball games, concerts and special events. Statue of LibertyVisit the Ststue of Liberty Island and Ellis Island. Ferry rides to and from. Sightseeing tours and boat trips around the island. Walks to the top of the statue are by advance ticket purchase only. Times SquareWorld famous site of theatres and famous buildings with plenty of restaurants and shopping. United NationsSite of world famous international building for diplomats and government officials. Wall StreetWorld famous financial district. Yankee StadiumSite of NY Yankees baseball team and special events and concerts.